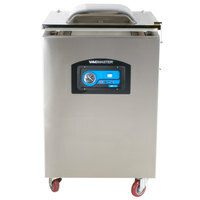 Increase food's shelf life with this ARY VacMaster VP540 chamber vacuum packaging machine. 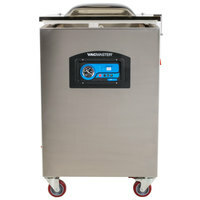 Perfect for vacuum sealing soups, stews, marinades, and other foods for sous vide cooking applications, the VacMaster VP540 vacuum packaging machine seals by taking all the air out of the chamber at once, without drawing liquid into the seal area, and makes a stronger seal than external vacuum packaging machines. 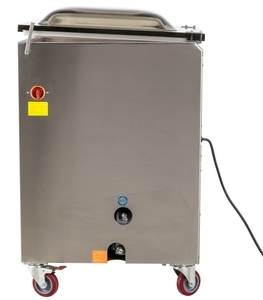 This means that you can use this machine to seal liquids in bags for more efficient storage. "Absolutely a workhorse. We vacuum 200-300 pounds of chicken every week with this unit and never had a problem. Played around with compressed fruit & this machine does what it need to and does it to well. Delivery went great. Unboxing it was pretty easy. 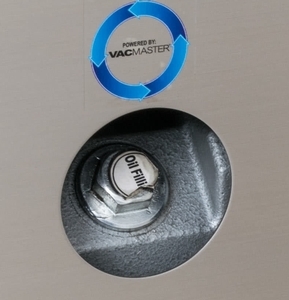 VacMaster was very helpful…"
This powerful 1.5 hp oil pump runs more quietly and quickly than a dry pump making it a smart investment for your business. There is no risk of it becoming overheated and it doesn't require a cool down period. This allows the pump to continuously deliver air-tight seals time after time. 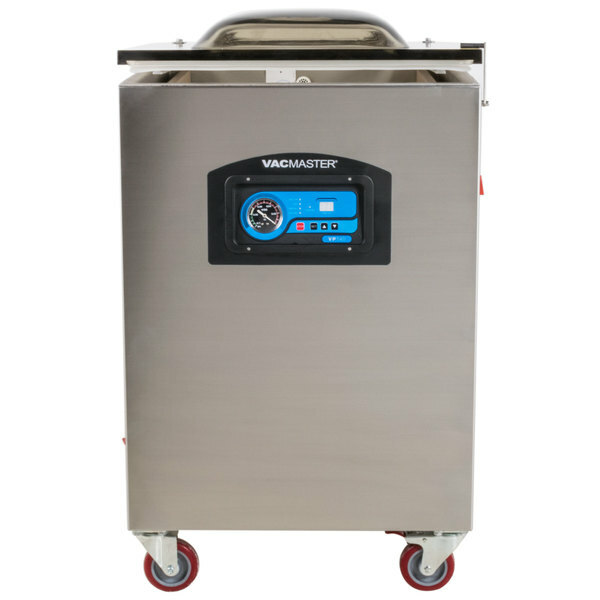 Tested for up to 200,000 cycles, this model is great for continuous, heavy-duty use. 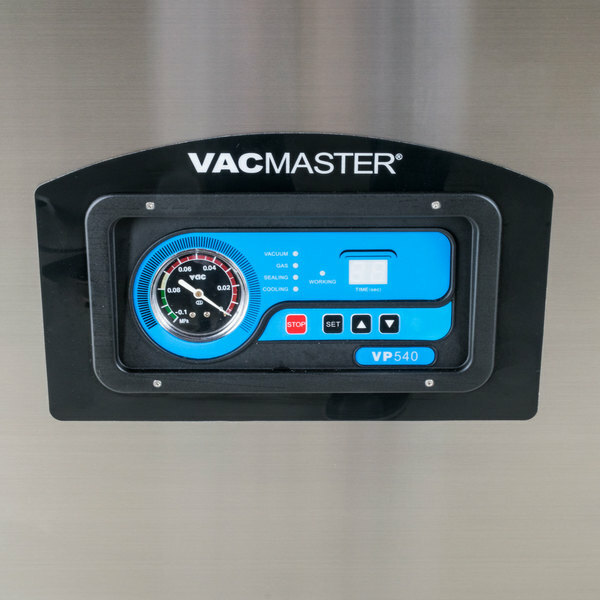 This simple, intuitive control panel allows you to adjust the seal or vacuum time as needed, while the stop button halts the vacuum cycle and immediately seals the bag. 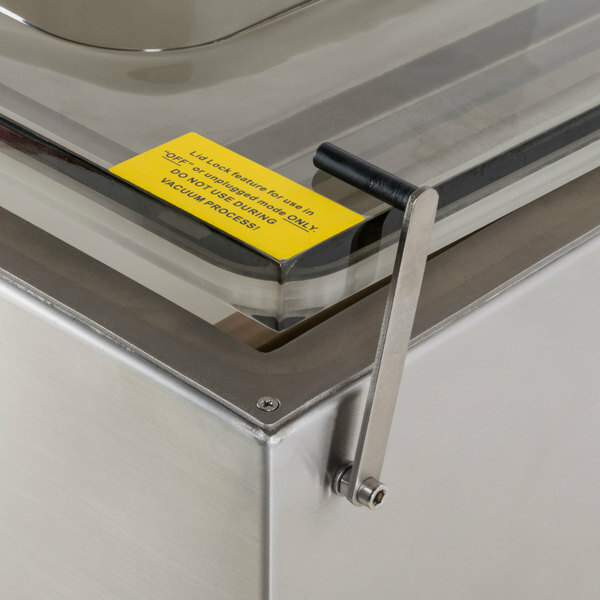 The see-through lid makes it a breeze to keep an eye on your products and make sure that you avoid crushing food while sealing it in the chamber. 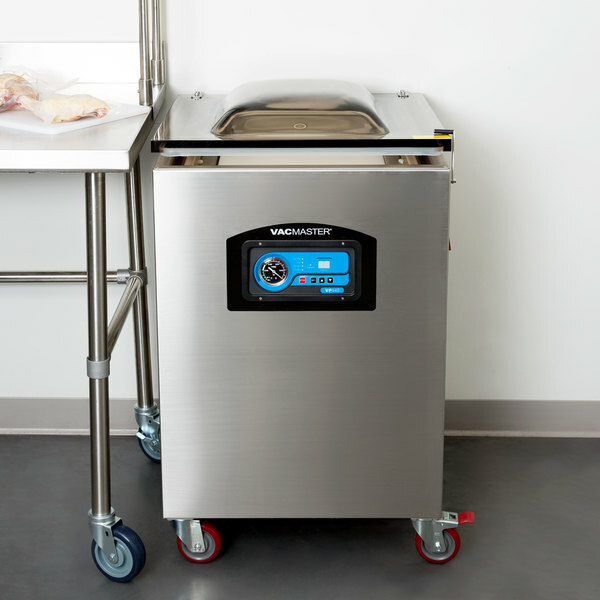 With its durable stainless steel construction, this vacuum sealer is made for long-lasting use in your commercial kitchen. Plus, it's easy to clean and maintain. The ideal height for storing on the floor next to your work tables, this unit is perfect for commercial operations with limited counter space. 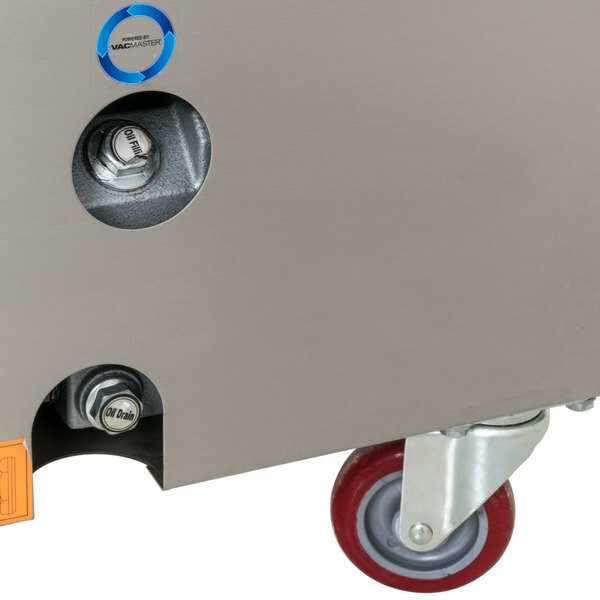 This floor model vacuum packaging machine has 4 easy rolling casters so you can move the unit out of the way when it's not in use. The large 20" wide seal bars are set 16 3/4" apart to accommodate large pouches. Plus, the double wires provide optimum results. 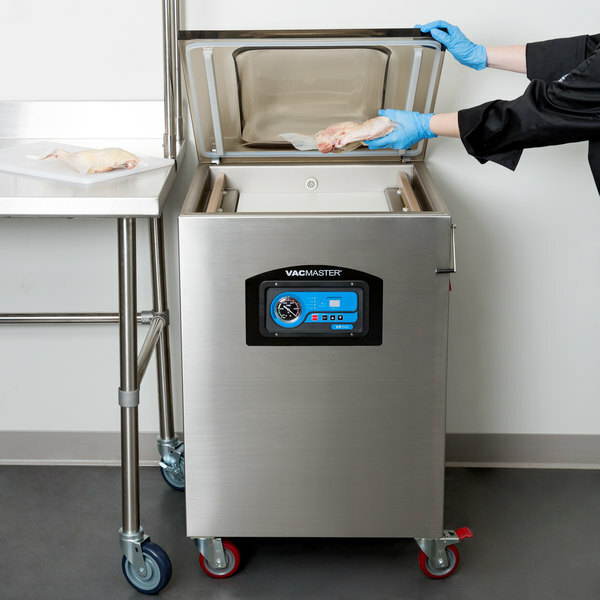 The quick cycle time of this machine, 20-40 seconds, allows you to quickly seal portions of food for freezing or sous vide cooking. This unit comes with 100 assorted vacuum chamber pouches, 2 filler plates, and a maintenance kit so you can start using it right away. How do high altitudes affect the vacuum sealing process? 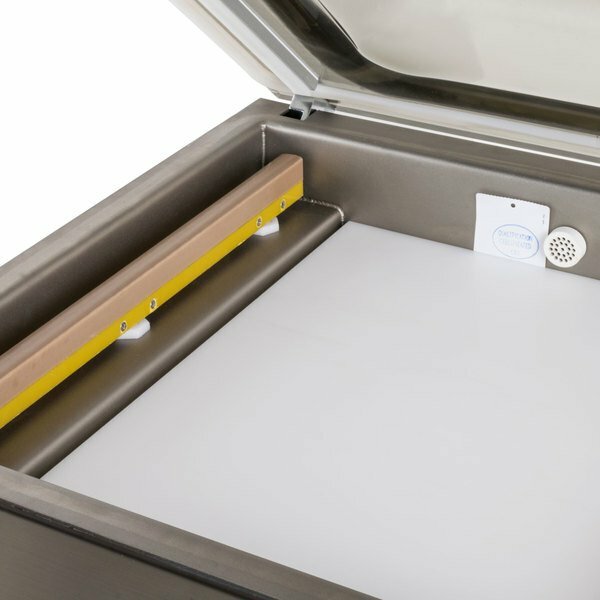 A vacuum sealer’s performance varies with respect to location. At higher altitudes, where air pressure is less dense, vacuum sealers are unable to remove as much air from the sealing process. High-pressure conditions are an important factor in the proper functioning of the sealer’s compressor, and without enough pressure, you may notice a weaker vacuum. Can this machine be used for retort or mylar packaging? 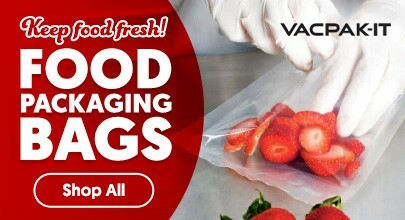 These vacuum packaging machines are not recommended for use with retort or mylar packaging; instead, we suggest choosing from our wide selection of vacuum packaging bags for best results! Retort and mylar packaging requires special plastic and foil laminated pouches to seal food safely. How do I determine if a vacuum machine bag will work on my machine? If you have a chamber-type machine: Buy a chamber-type bag (mesh-less design). The open end of the vacuum bag must be shorter than the seal bar on your machine, and the bag must also fit inside your machine’s chamber. If you have an external-type machine: You must buy an external-type, or "out of chamber" bag (mesh design). The open end of the vacuum bag must be shorter than the seal bar on your machine. All of our vacuum machine bags list how large the open end is, and whether you can use them with external or chamber machines, in the content. Can I put mason jars in my vacuum packaging machine? Yes, if the mason jar fits, you can put it in your machine. However, it is not a substitute for canning. 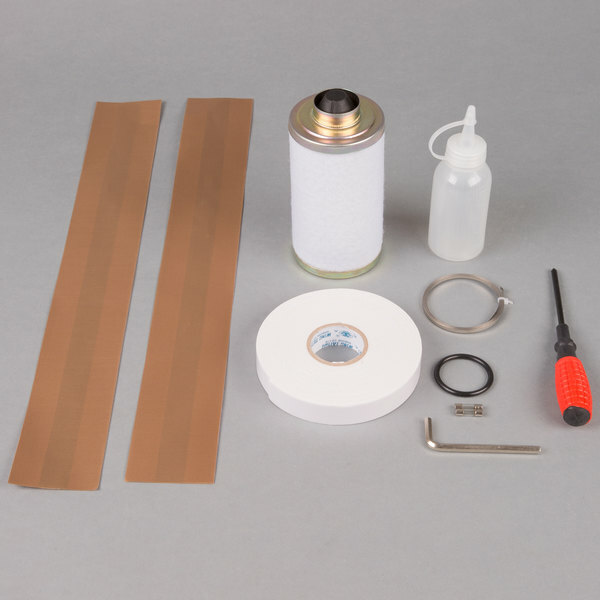 This simple tutorial illustrates how to add oil to your chamber vacuum sealer. All you’ll need is a 7/8” socket wrench and oil! Fill the site glass ½ to ¾ of the way full, and just like that, you are done. 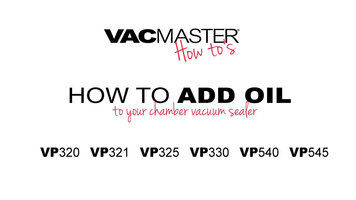 This simple tutorial illustrates how to drain oil from your chamber vacuum sealer. All you’ll need is a 7/8” socket wrench and a container! Remove the drain plug, and just like that, you are done. 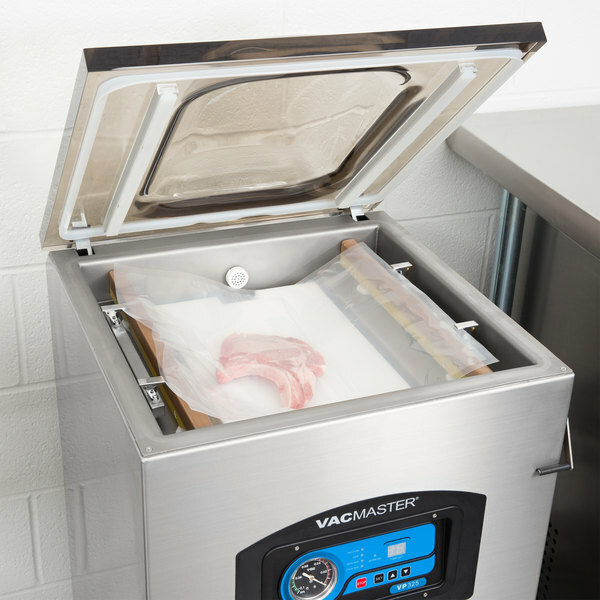 How to add oil to your chamber vacuum sealer. Remove the oil fill cap using a 7/8” socket wrench. Add oil into the oil chamber by squeezing the oil tube and gently pouring it into the spout. Fill the sight glass 1/2 to 3/4 of the way full. Do not overfill. Replace the oil fill cap by twisting it back on. Tighten with a 7/8” socket wrench in a clockwise motion. 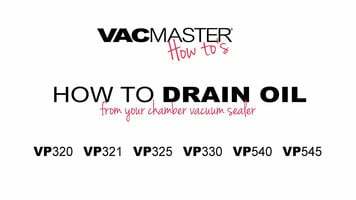 How to drain oil from your chamber vacuum sealer. Important: step 1: prepare oil in the pump. Run the vacuum process a few times. 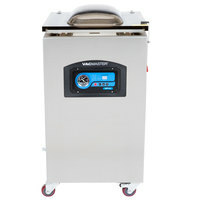 This will warm up the oil, allowing it to drain freely and remove any contaminants. Step 2: Turn off and unplug the machine. Remove the oil drain plug using a 7/8” socket wrench in a counter- clockwise motion. Allow the oil to drain into a safe container. Replace the oil drain plug with a 7/8” socket wrench in a clockwise motion. We got our vacuum sealer yesterday. It was easy to uncrate and get set up. Perfect for processing deer and knowing the meat will taste fresh much longer. Great product and very user friendly! This is a fantastic machine. We use it to regularly package poultry hundreds of pounds of poultry in a day. We've used it on chickens, ducks and even large 20 lb turkeys. It does them all! I recently purchased a second machine to speed up the process. Having two single chamber machines is essentially the same as having a dual chamber machine. This vacuum sealer is large but easy to operate. The seal is great every time and love having it around for charcuterie and marinating! Fantastic product. Absolutely a workhorse. We vacuum 200-300 pounds of chicken every week with this unit and never had a problem. Played around with compressed fruit & this machine does what it need to and does it to well. Delivery went great. Unboxing it was pretty easy. VacMaster was very helpful when I called with questions. So glad i bought this unit! We use it on so many items everyday. Excellent vacpac machine. Pay attention to if the vertical depth of the well will fit your products...i have had some large turkeys and strip primals that didn't quite fit. Have had it almost one year now and am starting to get some rust on the interior.....will contact them about it...I suspect one of our cleaners is incompatible. Easy to use and easy to clean....that matters most! 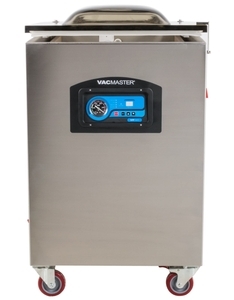 We purchased ARY VacMaster VP540 Floor Model Chamber Vacuum Packaging Machine in May no complaints, it works so well we are buying another one for another facility. Very durable for our needs. If your every in the market for a good CroVac machine this is the one to choose. We purchased our first one over 8 years ago and it finally sealed it's last product last night, so I am back online today to place an order for another one. 5 stars!!! Great machine. Crated and delivered in perfect condition. I enjoy webstaurants huge selection and and good customer service. The video tutorials are awesome and very helpful. Only one thing was missing from my order and they have already reshipped it. Ordered this unit for home use. I would give this unit 5 stars. I have sealed everything from shrimp, to water just playing around. I would recommend this unit to everybody. 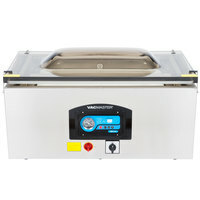 It is a very easy to use and easy to understand Vacuum Sealer. Works great. Only problem we feel is changing oil. The location of the oil input / drain is hard to access with a wrench. All stainless steel body and a powerful machine.